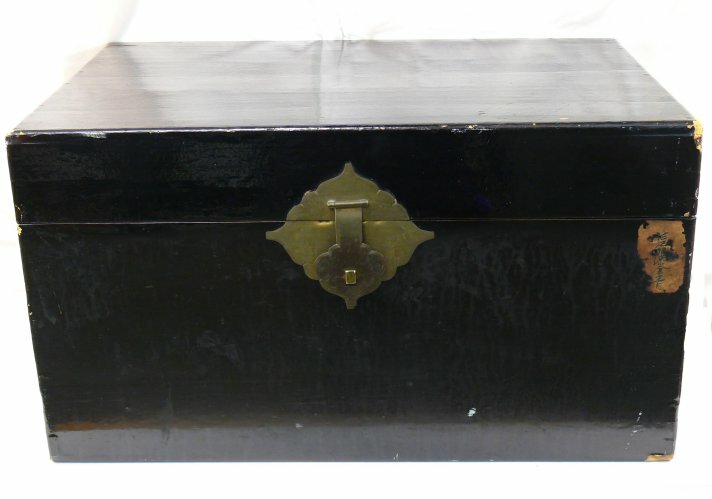 Storage Trunk Wooden trunk; painted shiny black; 4 rectangular metal hinges at back; 2 metal handles on sides of trunk that have hook like details and a round stopper; front has metal clasp with scalloped edge detail (15.5cm L x 13cm H); right side of trunk has 7cm x 4 cm patch of darkened/burnt paper with Chinese characters; interior of trunk is varnished and shiny. Storage trunk filled with women's clothes. Brought to Canada from China circa 1900. The donor's father Bing Kee Chung came to Canada arriving in Victoria, B.C. April 8,1896. Her mother, Lim Shee Chung arrived in Vancouver February 10, 1912. The couple was married February 15, 1912. Lim Shee Chung died in Chilliwack age 40 on January 12, 1937. Her name is given as Lum Shee Chung in BC Vital Events records from the BC Archives. Bing Kee Chung died in Sardis, age 73 on April 21, 1939.